Where will we create value in the future? That won’t be much different than in the past. The value of a car is not the thing itself, but in the mobility it enables. The car as we know it today has reached its summit. The mobility it could provide is no longer fully available. The same applies for the carbon based fuels it burns. The reasons for this are on the one hand overconsumption, on the other hand cars and the centralised road infrastructure were never adapted to the increased usage. Hence, we should seriously consider if maintaining the current (over)-production makes sense. What should happen is a total review of the role cars and its alternatives have to play in mobility as a social requirement. Another reason for the overconsumption of cars is that public transport is not a real alternative. Even when subsidised at 80% and more it is only an alternative in specific cases because it does not meet the basic requirement of mobility, i.e. a door-to-door mobility provided in a fluid and comfortable way. This means that all transport modes should seamlessly connect. This will not be solved by producing even more cars, buses or trains. The only way this basic need can be fulfilled is by abandoning these old technologies and by replacing them with a new solution we call the e-mobility platform. Depending on its use it behaves like a car, a bus or a train or even as a truck. This is also the right moment to switch to environmentally friendly electricity and to switch to a new fault-tolerant architecture that allows the mobility platform to bring its passengers or cargo automatically or semi-automatically to their destination. To put things in perspective, imagine we are in the year 2025 and let’s assume that the switch to such an e-mobility platform has happened. What does it mean concretely? John wakes up in his passive energy house. His energy consumption is a fraction of what his parents were consuming. Most of the energy is used for cooking, washing and for the necessary air ventilation. When the sun is shining, thermal and photovoltaic solar panels provide for hot water and electricity that is partly stored in batteries using nanotechnology based porous carbon. Only when it is very cold for a longer period of time does the traditional net provide some extra electricity. In his garage he has a modular e-mobility car. He has a two-person, two-wheel driver’s module that he can connect to additional service modules. He possesses another 2 wheels module with 3 passenger seats and two transport modules. Each module has an e-motor in each of the wheels. Gyroscopic sensors keep the module upright. All electronic and the batteries have been safely integrated into the chassis. Top speed is 300 km/hr with an action radius of 1500 km when driving in “train-mode” over the old railway tracks, now leveled with concrete. The connection to a train happens fully automatically with the auto-drive then taking over. He can read his paper. Such movements are no longer that frequent. Most of the time he works from home in his holographic virtual office. Most of the city office building are gone and have been replaced by green city parks. It’s pleasant again to live in town and traffic jams are a memory of the past. If you think these are just stories from Jules Verne, you are mistaken. Most of the technologies already exist as a prototype, ready to go commercial. The industry is interested as well. Daimler recently bought 10% of the shares of Tesla Motors, an independent American manufacturer of electric cars. One of the models has a top speed of more than 200 km/hr, accelerates faster than the fastest Porsche and has a battery giving it an action radius of over 450 km. A small Wankel engine of barely 800 cc can be used to charge the battery if needed, giving it an average consumption of less than 3 l/100km. The weak point remains the battery, also from the ecological point of view. But even this problem is being tackled. For example the University of St Andrews in the UK has been working on a new type of battery that doesn’t need Lithium but uses porous carbon. First results give it an estimated capacity that’s ten times better. Small vehicles on just two wheels are on the road as well. The control algorithm used is a standard exercise for engineering students. The difference is made by the necessary gyroscope that is no longer mechanical but a small and cheap electronic chip. More challenging is the automatic driving in train mode. But that’s more an issue of having an adapted road infrastructure than of lack of technology. Even today some cities have buses driving around with no driver on predefined paths. One could ask why we should put concrete over the railways? First of all, railway tracks are ideal because they make big turns and they have little slant. Today, railway tracks take up a lot of unused space because trains operate with long intervals and they don’t operate all the time. There is also the energetic point of view. Electrical trains use centrally generated electricity and a lot of it is wasted before it reaches the locomotive. Moreover, the average weight per passenger of a train is over 2 ton. Energetically, this is as much as a heavy 4x4 SUV. And last but not least, railway tracks are often secluded away from areas where people life and hence generate less environmental noise. The concept of the e-mobility platform can also be applied to bulk cargo and passenger transport. The benefit is that such a platform can leave the main track and can move people and cargo from any point to any other point. The whole point is that we should not confuse the transport functionality and existing solutions. High Speed (maglev?) trains and airplanes are likely to remain adequate solutions for longer journeys. But the new e-mobility platform could be the train of tomorrow. Planned economy or a future oriented economy? An important question is whether or not it makes sense for the public sector to intervene keeping the private sector as it is afloat? The answer is clearly a no and there are better alternatives. Governments should only create a stimulating environment. Billions of taxpayer’s money have already been spent and money was created to save the financial sector. This doesn’t solve the issues but moves them to a future generation of productive citizens. The question is not whether or not the governments should help the companies at all, but what is the best solution? E.g. reducing drastically labour cost and adjusting public expenditures to available income might have much more positive effects. One should not forget that the generous hand of government also means that valuable means are no longer made available for future oriented investments, creating a negative spiral of negative growth and wealth creation. GM has now filed for Chapter 11. A major question in Europe is what can be done to save its Opel subsidiaries. Should the public sector invest in these factories and turn them into state owned enterprises? One should be careful not to fall in the trap of a planned economy. The effects of these can still be seen in formerly state-controlled countries. It might be painful in the short term, but in the long term we should try to preserve the know-how and anticipate the future. This will save more jobs. The global economic crisis puts every country in a position where it can take up new positions in the worldwide economic game. Shall it continue to assemble cars that represent past technologies or shall it become a developer and exporter of new e-mobility platforms? Technically speaking, why is electric better? One could also ask why we don’t really talk about hybrid vehicles? After all, they are on the road and provide lower emissions. They suffer however from two major issues. First of all, a hybrid vehicle is complex. The main reason is that it still has an architecture that is based on a central engine. That even makes the drive-by-wire dream problematic. Secondly, the lower fuel consumption is often not reached in practical use. When not using its electrical engines, a hybrid propulsion system is heavy. And last but not least, over the whole lifecycle hybrid cars are not that environmently friendly, mainly due to their Lithium based batteries. The conclusion is clear: hybrid cars (at least models where both types of engines are used to propel the car) are a transition technology. 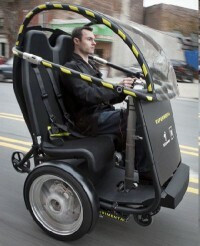 If we compare this with a two or four wheel electrical car, the advantages are obvious. A decentralised propulsion system is inherently fault tolerant, putting drive-by-wire within reach. Secondly, electric motors have an enormous torque, even at very low speed. Combined with high energy efficiency, this reduces the overall energy consumption. Last but not least, such an electric drive system is very light and compact because it doesn’t need all kind of auxiliary components like a gear box, a clutch, a start motor, a cooling pump, etc. Technically speaking, what else is required? Without going into detail, one can reason about other requirements that such an e-mobility platform would have to meet. Platform based: one can image a standardised, even common drive chassis (attached to the wheels) with the passenger or cargo cage being the differentiator for manufacturers. Do we still need a steering wheel? Or do we use we some kind of game stick? What algorithms are needed to drive the motor, have it work as a brake, let it recover energy from braking, etc? What is the equivalent of ESP and other safety functions? What level of fault tolerance is needed? What happens when the battery runs low? How will the automatic train forming happen? What kind of technology is needed? Will cars need to communicate with other cars? With road support systems? How can software be certified? Updated? How can a mobility platform migrate to newer technologies? It is clear that developing such an e-mobility driving platform and an adequate road infrastructure will require a lot of engineering. Pure research is less needed as most of the technology already exist, even if there is room for improvement. The introduction of such an e-mobility platform will advance the state of the art in battery and local energy technologies, will advance the state of the art in distributed control, including wireless connections, will advance the state of the art in smart sensors, error-free software and electronics. It will advance the discipline of safety engineering to become cost-efficient and will likely result in standards and applications flowing over in other domains. It's introduction can be compared with the emergence of internet. The world becomes global and connected but distributed at the same time.